Katie catching a stringer full of vermillion snappers. 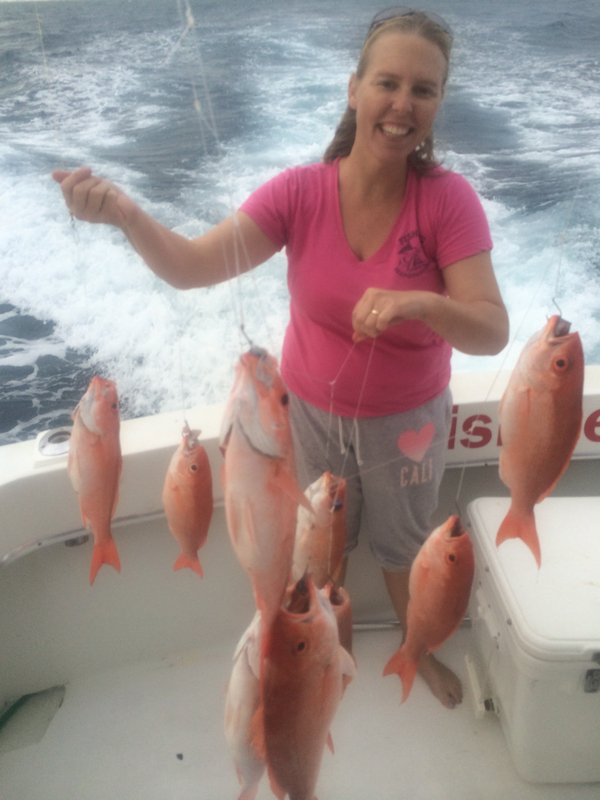 Today we took out my sister, Katie, on our sportfishing trip aboard our boat, the Big Game. 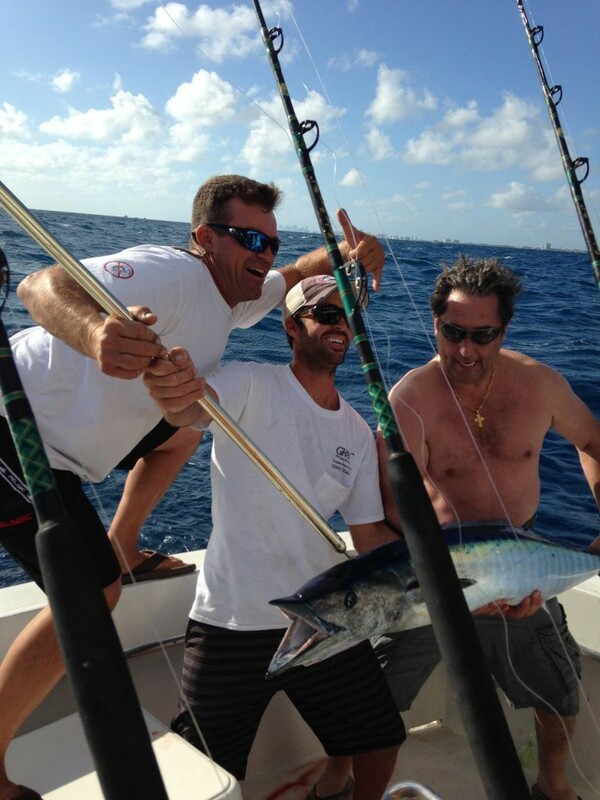 We started off catching some small tunas and bonitos on our way out to one of our favorite shipwrecks to fish. When we got to the wreck, we started doing deep drops using a multi-hook chicken rig. As soon as we hit the bottom, we could feel the bites… ratt-a-tat-tat, non stop. When it felt like every hook was hooked up, we reeled them in. It wasn’t more than a half hour before we had our limit in the box. A lot of the vermillions were big too, 3-4 pounds (that’s full grown for a ‘vermie’). 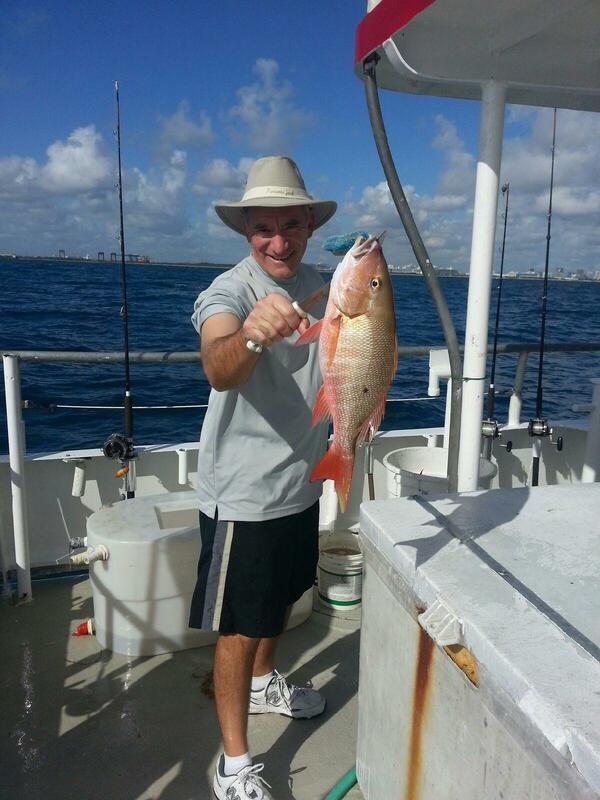 We got back and filleted the snappers and had a big family fish fry. I cooked the fish myself with my secret recipe. They tasted great! The snappers are snapping in Fort Lauderdale in 300ft of water. It’s a great time to go fishing! 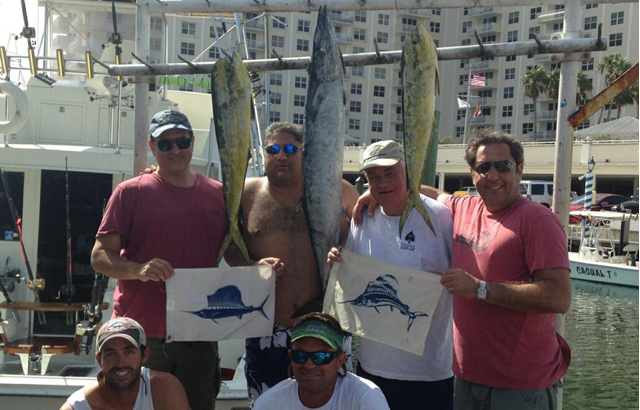 What a great trip today we had on our sportfishing charter. The sailfishing this winter has been phenomenal and we’re also getting some excellent dolphin action. Today we went kite fishing, out in 120ft of water, just mile off our coast. This area in 100-150ft of water is known as “Sailfish Alley” in Fort Lauderdale. It’s where the majority of the sailfish swim through, just outside the reef and on the inner edge of the Gulfstream. We had our baitwell stocked with fresh and frisky goggle eyes and mullets. We caught our first sailfish within 10 minutes of having out baits out. We caught and released him and immediately put out the spread for another shot. The next fish was a mahi-mahi, which ate a goggle eye on the short-left kite bait. As we were fighting the one mahi-mahi, we noticed a second one following him in, so we pitched out a spinner and hooked into the other dolphin at the same time. We caught both fish, threw them in the fish box and guess what we did next? We put the kites out again for another shot. Never leave fish to find fish, that’s the first rule of fishing. We had to sit with our baits our for almost an hour for the next bite, but it was worth it. Another 7ft sailfish catch and release. Well, we stuck with kite fishing for another hour without another bite, and it was getting late in the day, so we decided to finish up our trip trolling the blue water edge on the way home. Wouldn’t you know it, to finish off a spectacular day, the wire line deep bait, held deep by a 1.5 pound trolling lead, got slammed. A big wahoo took the bait and took half the line off the spool in his initial run. We fought him up to the boat and stuck the gaff in him. What a way to finish the trip. We got back, took some photos and fileted the fish. We took the filets over to Coconuts Restaurant to cook them up and the chef did a great job. We had some great cocktails and the Catch of the Day, literally! We’re getting some good action on our daily drift fishing trips this week. The snappers on the bottom are getting pretty frisky. 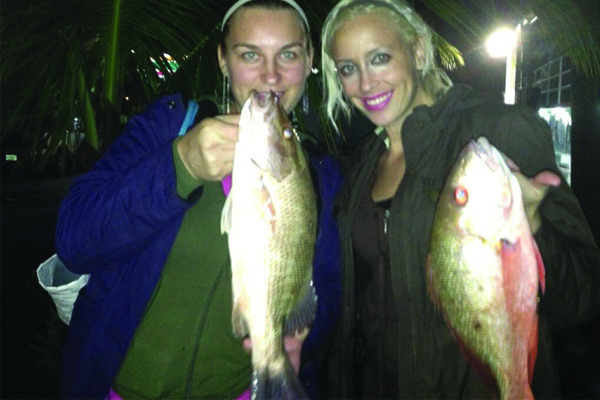 We’re getting into some bigger mutton snappers on the day trips, but the best snapper action is definitely at night. At night, snappers come out of the woodwork to feed. 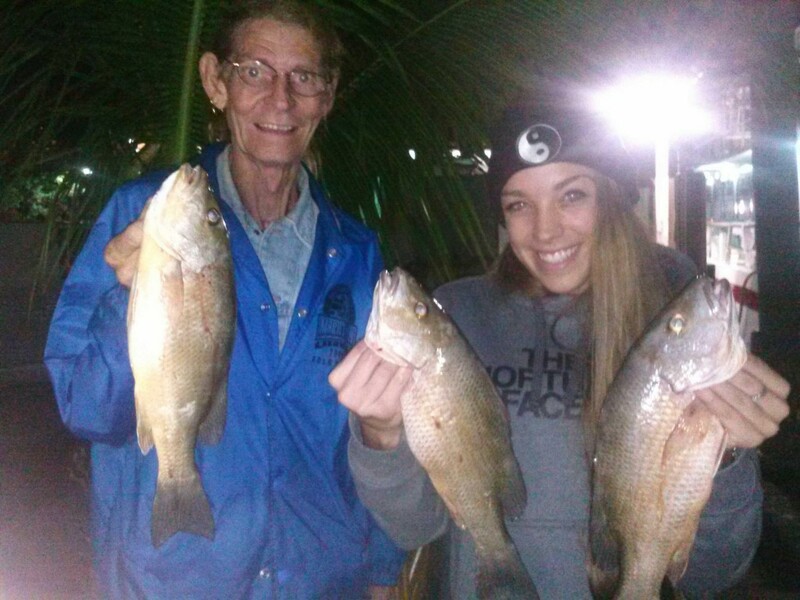 A lot of our gamefish bite better during the daytime hours, but snappers, sharks and a few other species bite best once it gets dark. 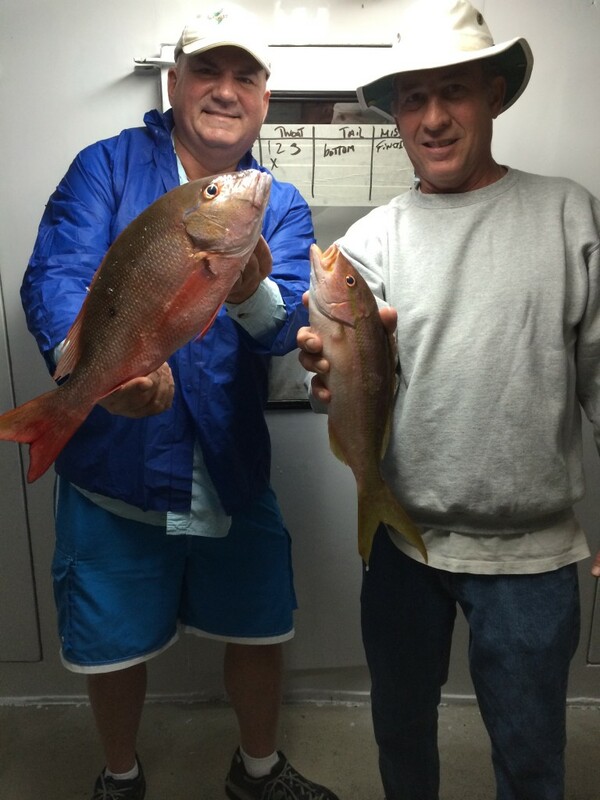 The mangrove snappers we’ve been getting have been very large. They’ve been averaging 3-5 pounds, much larger than the usual mangroves we catch out there. Yellowtails are biting too but mostly smaller ones. In the winter months, yellowtails move in to shallower waters. Since the best mangrove bite happens late at night, we’ve been starting off in shallow, catching a bunch of the small yellowtails, and them moving out deeper for the late mangrove bite. Our Saturday night 6 hour trip did very well on the larger mangroves this week. A few very nice fish such as grouper and cobia are out there and biting on occasion, but not that many that can be counted upon. You have to get lucky to hook into the larger fish and then have heavy enough tackle to actually land them. Since we’re targeting smaller snapper, we often don’t have large enough gear down when one of these bigger bottom fish take the bait. Pretty good action this week on snappers, day or night, but especially on the night anchor trips. Good luck fishing everybody!